In front of our Hotel, in the same quiet street, strategically located to reach Venice in few minutes by public transport, you will find this small flat completely renovated and furnished with all comfort. The apartment can house max 6/7 people, and it consist of an ample living room with sofa-bed and with dinner table, 2 double bedrooms + pouf-bed *(twin bedded just on request), small kitchen (furnished) and bathroom with shower, hair-dryer and towels. You will find also (free) Wi-Fi connection, TV colour, washing machine, adjustable air-conditioning and independent heating. *) We do not have an elevator. If stairs are a problem for you, then our annex is not a good choice. – Possibility to have buffet breakfast at the Hotel (only by advance order), price 7 euro per adult a day and 4 euro per child under 10 years hold. – Hotel car park available free of charge (is required to leave the car key at reception). – Separated beds or extra beds just on request at the price is 12,00 /18,00 euro per person, we can give you a cot (free of charge) for baby. 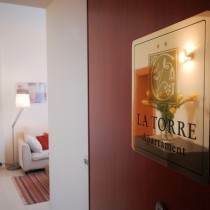 – Formula residence “FR”: INCLUDES: bed linen and towels, use of the kitchenette (equipped) with oven, washing machine and final cleaning of the apartment. DOES NOT INCLUDE: daily cleaning of the rooms and the bath. Linen will be change every 3 or 4 days. We ask to our guests to bring various rubbish, personally to the Hotel, thank you. *) On request it is possible to have extra cleaning 30 euro cost or complete change of linen, cost 10 euro per person. HARRY UP! Check the availability on line and book!